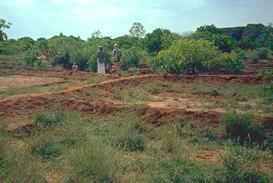 Perhaps the most pressing task for the first settlers in Auroville was to discover and implement methods of regenerating the eroded land. Over the past two decades of effort, Aurovilians have evolved and developed sustainable and effective techniques. The key is an integrated water and soil conservation program. 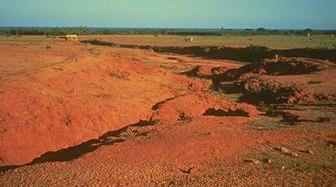 In the past, the monsoons would wash over the barren land, carrying topsoil to the ocean and creating deep ravines and gullies. The first step in halting that trend was planting trees to stabilize the soil, retain moisture, provide shade, and replenish soil nutrients. Over two million forest trees, nut and fruit trees, hedges, and shrubs have been planted on the acreage available for development. A second important technique for halting erosion was contour bunding. In bunding, interlocking grids of earth mounds enclose areas of land, preventing runoff and allowing rainwater to percolate down to replenish the water table. Extensive bunding has been carried out over each of the watersheds in Auroville. At some of the largest gullies, check dams have been built, creating reservoirs and preventing further runoff. Additionally, Auroville has adopted pesticide-free organic gardening to complement the protection of scarce soil and water resources. Since Auroville land and village land are intermingled, this development has aroused the interest of local farmers in adopting new practices of land use and restoration as well as organic farming techniques. In recent years, Auroville has increasingly involved itself in educational outreach with villagers through informal exchanges of seeds and information, as well as through organized seminars and training sessions in Auroville with the participation of local and state forestry departments. These sessions draw participants from all over India. Because of its national recognition in the environmental field, Auroville has been invited both as a consultant and initiator for afforestation programs in other states. 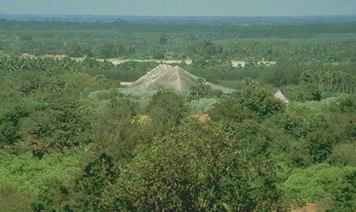 See also the environmental page on the Auroville site.